It’s Christmas eve – and here’s a present for the girls! Now, tonight’s blog is for all the girls – I promised you something special, and here it is. Firstly let me introduce a couple of our winemakers to you – I took this photo only Thursday at the winery breakup lunch, so it’s nice and current. On the left is Kevin Glastonbury, on the right is Sam Wigan. 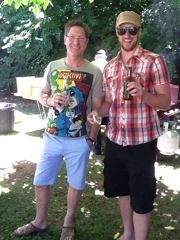 Lovely charming blokes, excellent winemakers, and not bad looking at all. Sam is also a bit of a star local sportsman, and plays for the Nuriootpa Tigers (Australian Rules) football team.They have made their own player calendar for 2012 as a fundraiser, and the ink’s not even dry yet, but I was able to get a copy early so you gals could have a bit of an early Christmas treat! 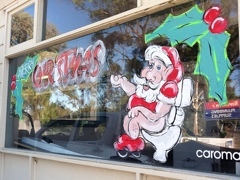 Here you go – Sam’s photo from the Nuriootpa Tigers calendar!! 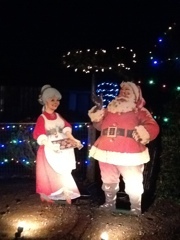 There you go, happy Festive Season girls……..hope Santa is good to you all, and I’ll see you when it’s Boxing Day. Morning folks, and it’s going to be a hot day here in the Barossa – the sun’s already got some sting in it, so I ‘m glad I’ll be hiding out in the aircon today. On my way to work this morning, the lads were filling up the eskys (Australian for igloo chiller in the USA or chilly bin in New Zealand, cold box I guess in the UK) with ice and heading for the river with the dinghy and fishing rods. On a day like today, I’d want to be coming in right now from three hours with the hooks in the water, and be tieing the boat to one of those big gum trees below the Swan Reach pub. 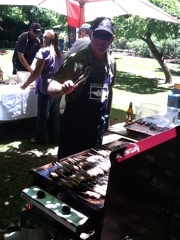 Then it would be up to the pub for breakfast and possibly back into the water at about 6……..pm that is! Santa with his sleigh modified to be whipped through the skies by a team of kangaroos. 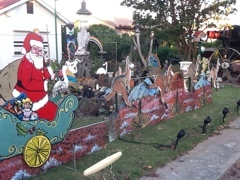 This is a famous local Barossa landmark – in Nuriootpa, on the road out to Greenock – and each Christmas – as long as I’ve been in the Valley anyway – it appears in the front yard of an old timer retired maintenance engineer. As soon as it gets dark, the kangaroos start bounding along under spotlights (pretty impressive what a whole dose of bicycle chains can do) and each year something extra seems to be added into an already jam packed front yard. So four more sleeps kids………..and tomorrow I’ve got some more sights in mind, but will have to wait until after 9 pm when it all lights up. See ya tomorrow when it’s our official end of year lunch and breakup. 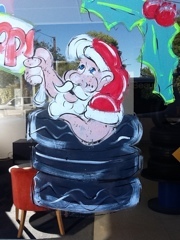 Only 5 sleeps until Xmas! Afternoon, all, and we’re back on the air, right into the Festive Season, and only 5 sleeps left until Santa visits all the kids who have been good and worked hard this year. With any luck, there’s quite a few of us who fall in to this category throughout the Yalumba and Negociants world, and Santa just may have us on the list to get one of the treats we’ve been after. I missed out last year with my wish list – I guess it was a long shot to get a dinner date with George Clooney – hopefully I’ll do a little better this year seeing as I’ve asked for something completely different. I should ask for a better season for my Australian Rules Football team – St Kilda – what a woeful year 2011 was for them! But I’m renewing my membership because you have to stick with your side for the long haul – let’s just hope the new coach does some good. 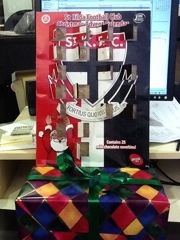 Here’s my St Kilda FC countdown to Xmas calendar – only 5 chocs to go! 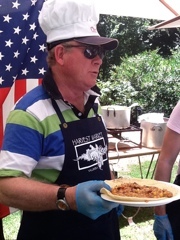 We have our winery, nursery and vineyard staff breakup lunch on Thursday down on the front lawns at Percy’s ( the homestead next to the Tasting Cellar that is used as a bed and breakfast for folks visiting Yalumba) and that’s always something to look forward to. Before we get to that – over the next couple of days I’ll take you around Yalumba and the Barossa to show you how the Festive Season lands in our part of the world. 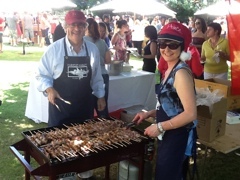 PS We’re also up to our ears with organizing the schedule for “Yalumba goes to the USA & Canada” from the 17th January through to the 29th March, and those events will be up soon in the ‘Dates’ section of the blog. If there’s anything happening near your town, don’t forget to let us know if you want to drop in … always keen to see our mates abroad! We’re back at the winery now, folks, until the Christmas party breakup day, which will be Tuesday 22nd December. This will give us a chance to scoot around the vineyards and see how things are travelling, and catch up with folks in the Barossa that we haven’t sighted for months. 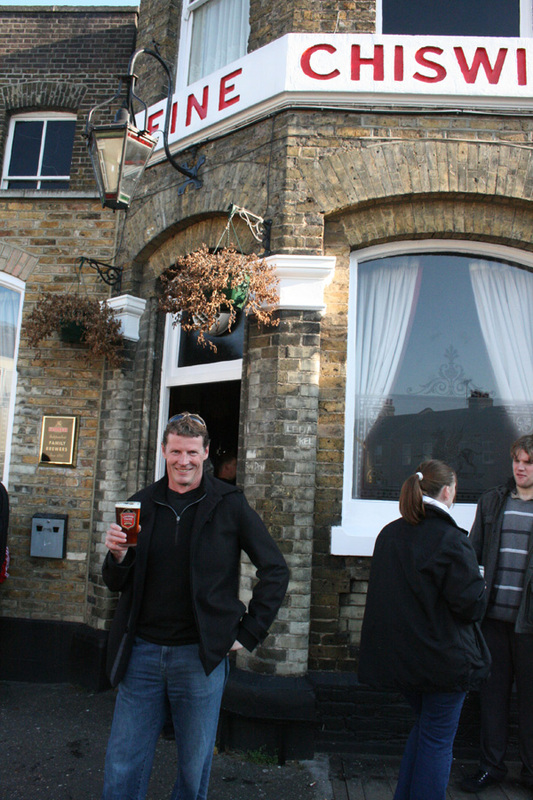 they’re the only team in the UK where there’s a pub at each of the corners of their home pitch! 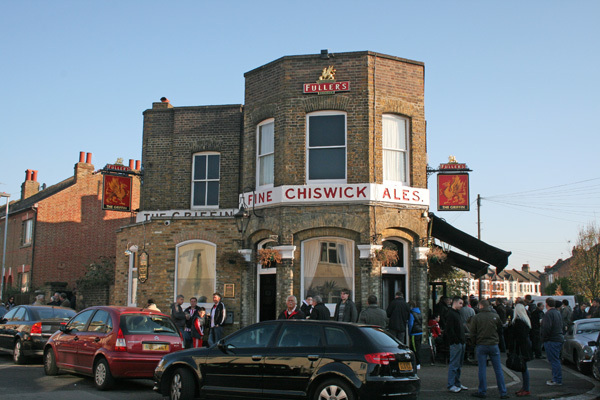 Pub 1 – The Griffin – closest to the train station, and you should have lunch there as well – burgers straight off the BBQ in the back beer garden. 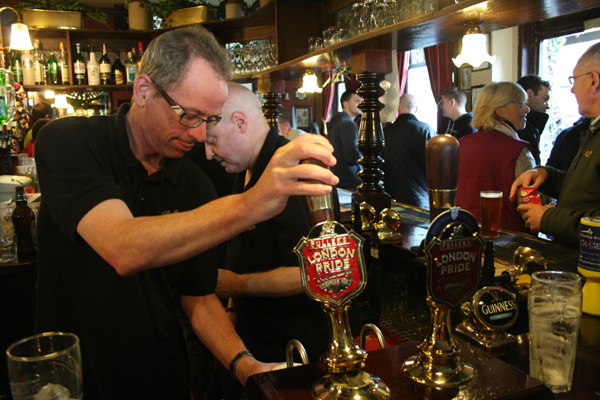 Here’s the action inside the Griffin as they poured our first pints of the day, and Clive doing the right thing! 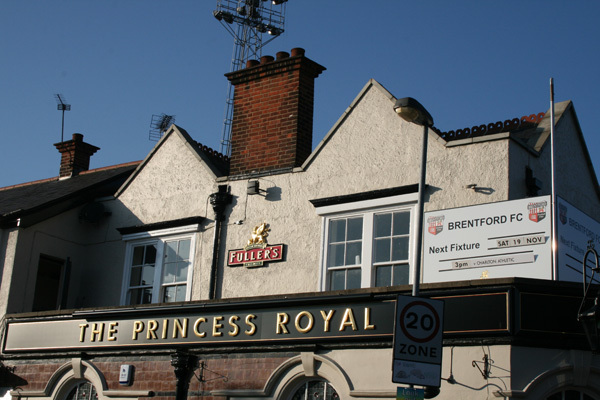 Pub 2 – The Princess Royal – which is just next to the turnstiles and is owned by the Football Club itself. Beware the defending guard dog at The Princess! 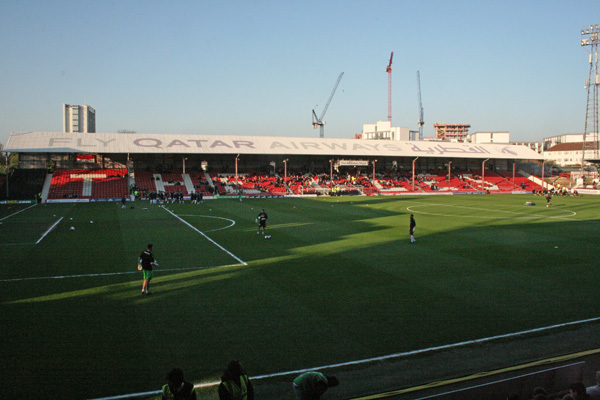 Then it was off to the game – The Bees home pitch, which has always had some airline advertise on the roof, seeing as its directly on the flight path into Heathrow. The Bees put up a hell of a fight on the day, but went down to Charlton 0-1. 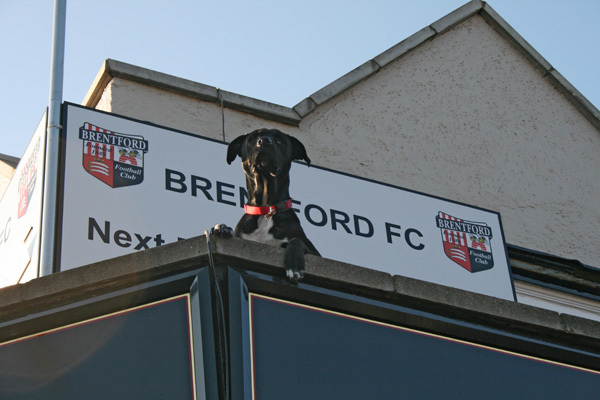 It was a bit of a shame really, as one ball literally belted in for the Bees, then bounced back off the cross bar! We had a chat to the goalkeeper Richard Lee after the game, and told him it was a really cruel result – you always have to make sure your boys get some solid support! 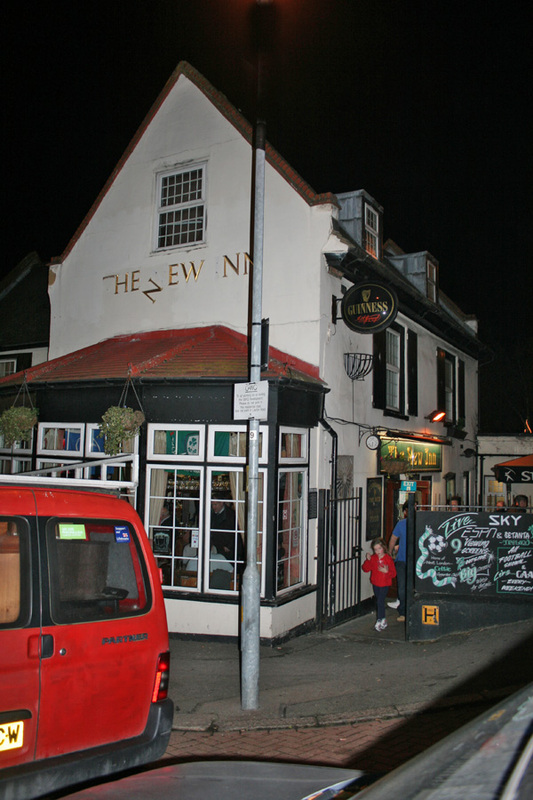 Pub 3 – after the game, it was on to The New Inn – and a post game yarn with other Bees supporters about the nearly goals and should have beens – always a good part of the whole experience. 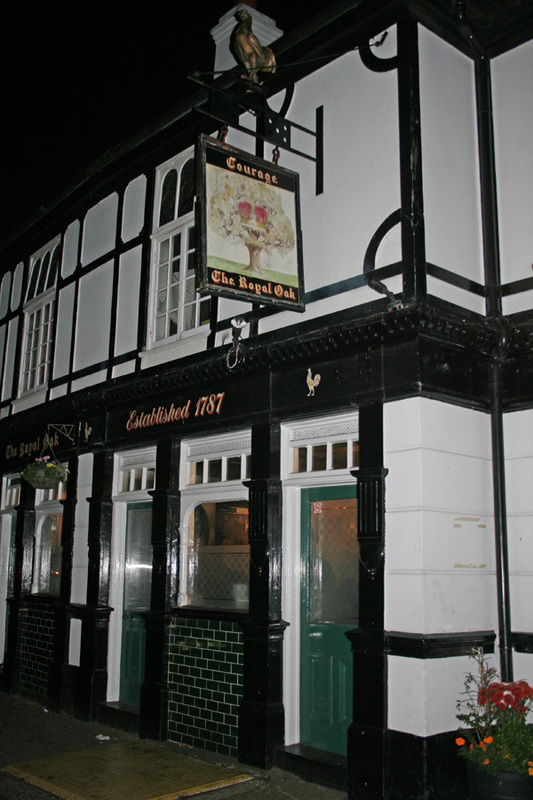 Pub 4 – up the road and back toward the train station was the last of the corner pubs – The Royal Oak. The front bar was full of gloating Charlton supporters so you can understand why this was the quickest stop of the day. All in all – an absolutely top English sporting day out – and I’d reccommend it to anyone visiting London who wants to get a taste of the real football thing. I’ll be back – I might even join up as a member – The Bees have got far more chance of doing well than my sorry football side here at home, St Kilda. And PS – to my favourite striker Clayton Donaldson – thanks! Every time this lad gets anywhere near the ball it’s exitement time!Legs that go right up to his neck … and can they move! We’ll see ya when it’s season 2012. Home for a while, folks, and tonight’s job will be to put up the Christmas tree, seeing as our family get-together, Festive Season lunch will be at my place. The nieces and nephews love it because I decorate the tre with all sorts of edible ornaments … and they get to make up showbags to take home from the tree at the end of the day. The big kids make sure they don’t miss out either. The big favourite most years are the chocolate elves with the popping candy bits in them! But before I get too carried away with what’s happening in a couple of weeks, I just want to backtrack a bit across the last few days up in tropical FNQ. 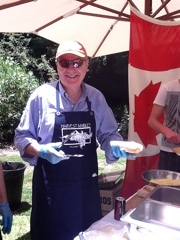 First up was my visit to Rusty’s market in Cairns last Friday morning. It’s a fruit and veg market mainly, and starts at 5am – which makes a lot of sense, given the way that the days get really humid really quickly after sunrise. I love it because you get all sorts of tropical fruits super fresh straight off the trees – and you get an opportunity to try a lot of the fruits that we never really see at all ‘down south’. 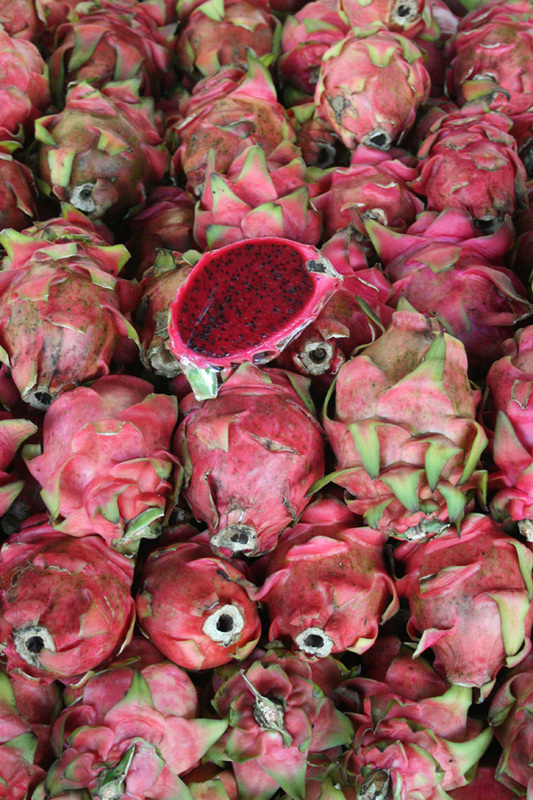 Last trip to Cairns (earlier this year) was my first ever taste of Dragonfruit – the bright purple ‘flower pod’ – that tastes like a cross between strawberry or raspberry and kiwifruit. And this trip, it was a whole new look at bananas. 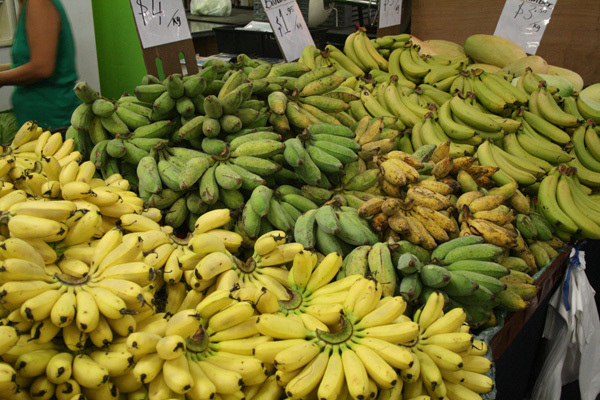 The common variety that we have everywhere across Australia is the Cavendish. As a bit of an alternative, sometimes we’ll see the small Lady’s Finger bananas in the Adelaide Central Market but that’s about it. Well, Last friday I was lucky enough to have the whole story and tasting on the four banana varieties: Cavendish, Lady’s Finger, Sugar and Monkey. The differences are huge. In this picture, I’ve got left to right – Monkey, Sugar & Cavendish fruit, which gives you a bit of an idea of the difference in size. 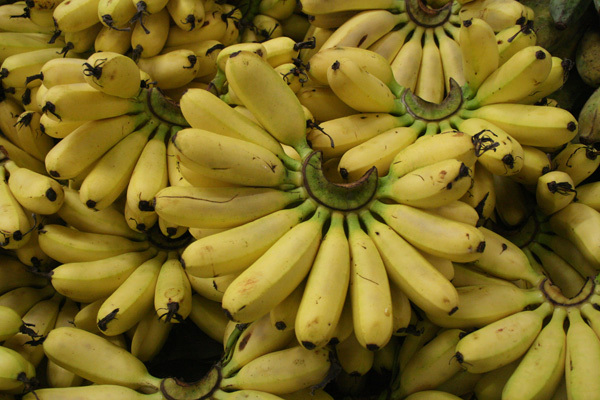 The Cavendish we know well – gristly and sticks to your teeth in a nasty way when it’s green, but very bananaey when it’s soft, and then it gets overripe quickly, collapses and is only good for smoothies and banana bread. 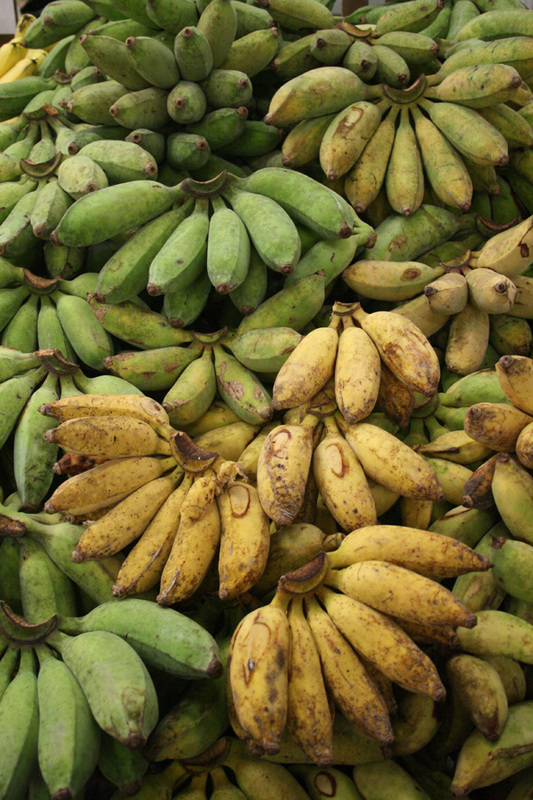 The Monkey fruit has a massively intense bananaey flavour without being super sweet – almost like the ‘ripe banana’ soft chewy lollies that you can get. The Lady’s Finger is medium banana and medium sweet and sits right in the middle of it all. Then there’s the big sweet hit of the Sugar banana. It holds its firm texture well even when really ripe, has solid banana flavour, but the winner is this silky sweetness that makes it absolutely perfect for cooking. 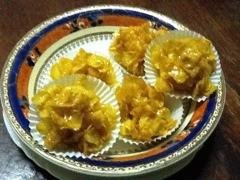 Especially when you’re looking for something to make tempura battered fritters out of – or to cook in a pan with salted butter and brown sugar or maple syrup. Yum! Any rate – have to run – even more from the tropics next time!